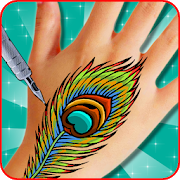 Tattoo Salon it is a great, free application. Take the chance to design your dream tattoos. In Tattoo Salon you can create your own colorful tattoo designs. Show off your skills and style! Inside application you will find many options. Choose a perfect place for your tattoo. Pick one from ready tattoos or create your own project. You can color your tattoo design the way you want. Let’s free your imagination. – 9 categories of tattoos ! – animals, butterflies, fantasy, flowers, hearts, mandalas, skulls, tribals and others. – Lots of tattoos to coloring. – 6 models for tattoo. – Tattoo your own photo! Tattoo salon will let you become the best tattoo artist. Start your adventure with Tattoo salon and explore your creativity. In case of any problems with the effect of Tattoo Salon, instead of giving us the negative opinion, please send us an e-mail and review briefly the problem. It will help us to solve it in the next updates of application. Tattoo Salon is free but contains ads inside the application. Revenue from advertising will help us to create new attractive games and applications. All permissions are required only for advertising and are supported by trusted vendors.